Our feed is made from top quality grain grown predominantly on the high plains of northcentral Montana and the surrounding region. The semi-arid climate and short growing season combine to produce some of the highest quality grain in the world. Our grain purchases support family-run organic farms. Our feed customer focus ranges from backyard poultry and livestock growers to small and medium-sized commercial growers. We are positioned to help meet feed demands of any customers. Our feed is Certified USDA Organic by the Montana Department of Agriculture, an NOP-accredited certifier. All our feeds are complete feeds, except poultry scratch. We formulate our feed with high quality, certified organic grains grown mostly in Montana. The grains we use in our rations include high protein wheat, barley, feed peas, and flax. The flax provides omega-3 fatty acids. We purchase these grains from organic family farmers who have a long-term commitment to sustainable production systems. We also purchase organic kelp, calcium carbonate and specially formulated vitamin/mineral premixes—all allowed for use in organic feed under the USDA National Organic Program. By using high quality, high protein ingredients we minimize our use of organic soybean meal. The variety of grains and minor ingredients in our feed assures the broadest complement of nutrients available for your animals. Naturally, our feed contains no hormones, antibiotics, coccidiostats, or animal by-products. We encourage prospective new customers to phone us before placing your first order, so we can answer any questions you may have and determine how to best serve you. We look forward to talking with you and answering your questions. We use several motor freight companies to ship our feed, and we’ll find the best shipping rate we can to deliver your feed as close to you as possible. Generally, our pallet rate of up to 2500 lbs. achieves the most cost-effective way of getting the feed to you. If you are picking up your feed directly, our milling operation is in Fort Benton, Montana, about 40 miles northeast of Great Falls just off Highway 87. 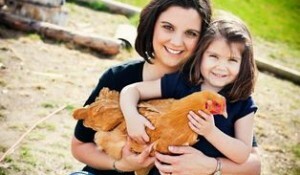 Millers of certified organic poultry and hog feed.